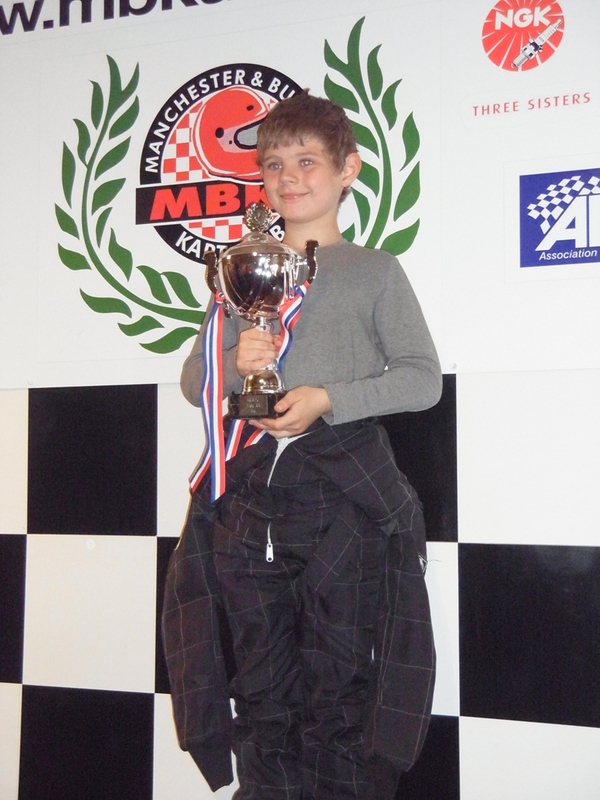 Samuel and Jacob Kart Racing: Manchester and Buxton Kart Club - August - First Place! Manchester and Buxton Kart Club - August - First Place! Another weekend - another race! This time at Three Sisters, Wigan for the Manchester and Buxton round 8 race. This was to be Samuel's last race as a Novice. In Heat 1 Samuel finished first for the Honda's and 11th overall (from 17) in all the Cadets, moving up 4 places from his start position. He set a time of 52.93 on the Valley circuit. The heat was red flagged due to an incident at Valley and the driver didn't compete for the rest of the day. Heat 2 Samuel he gained 3 places and again was the fastest Honda. In Heat 3 he again gained 3 places, was the fastest Honda but the race was red flagged as another Honda driver tangled with Samuel forcing him off, leaving a streak of black rubber across the side of his seat. Samuel was fine and drove back round to scrutineering. Two of the IAME drivers were not so lucky at the same point at Valley and both had to be treated and neither raced in the final. And if you are keeping tally, that is 3 trophies from his last 3 races and takes his overall total to 22 podiums and trophies in 20 months!